Crude Yellow Ware Pottery Jar? 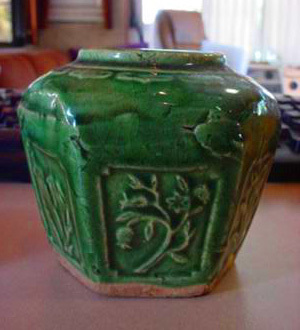 Photo shows my rather crudely made Pottery jar. It isn’t yellow. This is a very unusual small and very crudely made, possibly yellow ware, pottery Jar that I purchased at an estate in South Florida. There are no makers mark on the piece and it measures just 3 and 3/4″ tall. I would love to know who made this piece as I have researched it but found no details. Thank you for any help, Robert. Comments on Robert’s Crude Pottery Jar, that’s possibly Yellow Ware? Hi, I have one of these also. I believe it to be an old ginger jar. I have the same piece… any info on it yet ?